According to the German standard TP BF StB Part B 8.4 the Light Weight Deflectometer for the dynamic plate load test must be calibrated once a year. What could be more reasonable than choosing the cold season for the calibration? From experience we can tell that most construction activity will be suspended as soon as the outside temperatures drop below zero. During calibration the Light Weight Deflectometer will be checked through thoroughly. It will thus guarantee completely precise test results in the next season. TERRATEST is well prepared for the wintery rush and calibrates the Light Weight Deflectometers in two shifts. 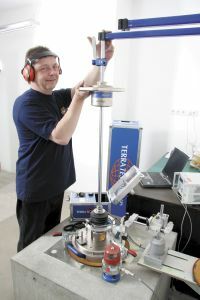 “We are well set up and promise all customers an immediate calibration of their Light Weight Deflectometers”, says Dr. Bernhard Korsch, manager of the calibration department at TERRATEST. “Our entire team works hand in hand, which is why there is hardly any waiting time”, adds Dr. Korsch.